We were a bit shabby the next morning having had one too many refreshing beverages with our mate Scotty. By the time we had the tent down and everything on board we were feeling something close to human. Heading down the main street of Strathalbyn to try and find breakfast, we were greeted by the sight of dozens of bikers (motor) filling the local cafes. Luckily the local establishments were obviously used to crowds and we managed coffee and pastries before hitting the road. It was relatively flat (compared to our trip from Adelaide!!) and fast to Wellington passing through the Mt Benson wine district, just over halfway. Stormy clouds had danced there way around us as we’d sailed East, but as yet we’d stayed dry. Of course, as soon as we headed South, the clouds caught up and we were soon drenched. The traffic had increased by about 500% as well, and that saw us having to move to the side of the road frequently to preserve not only our safety, but those of the drivers around us as well. At one stage a car pulled up and the occupants got out and stood by the side of the road waving a large package that looked, for all intents and purposes, like a rather large Kathmandu Tent. They were crestfallen we we assured them that it hadn’t fallen off one of our bikes. I think we would have noticed a 2 foot long, 4 kilo, orange package falling off one of the bikes. Still, very nice of them to chase us down and attempt to return it. About 20 km out of Meningie, we hit a few nasty hills, made even nastier by the rain. These continued for about 10km before things flattened out and we straggled into town. All up the ride was 96km and we’d averaged around 19kmph. However, when we’d hit the ferry, that was almost 25 kmph so we’d slowed down considerably over the last 45km. 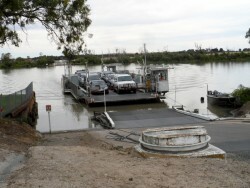 The Meningie Lake Albert caravan park was quite lovely by Lake Albert. Pelicans cavorted on the beach at the front and fishermen threw a line in from the comfort of their chairs right beside their vans. It’s definitely a good place for keen bird watchers to come. The facilities are clean and comfortable with great pressure in the hot showers. We notice these things when we’re cold and wet. 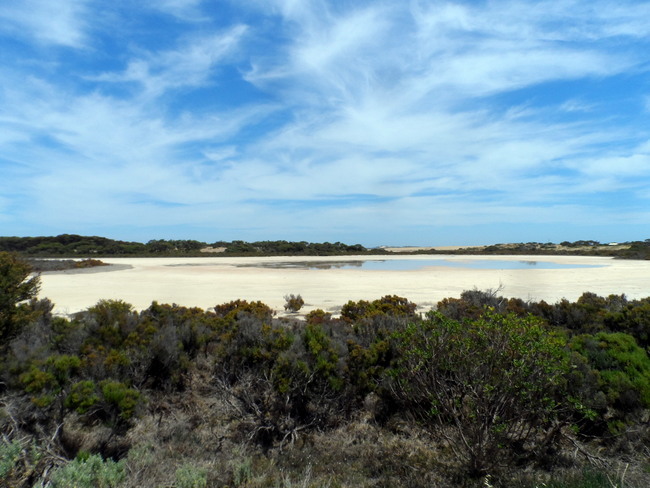 The next day we headed into the heart of the Coorong National Park. 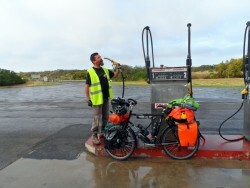 With predicted head winds, 62km to Salt Creek Roadhouse was a more than admirable goal. The wind stayed civilized for the first hour or so but as it started to heat up,it got stronger and stronger. The highlight of the ride was meeting two Dutch cyclists going the other way. It’s always nice to meet up and exchange courtesy’s and tips on the road ahead. 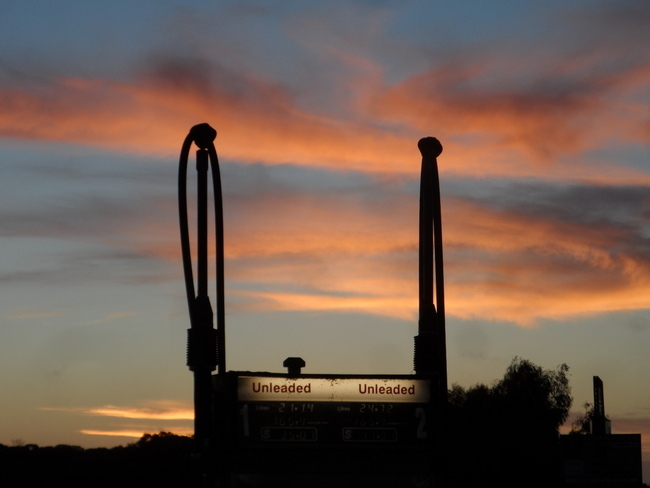 We were quite excited to pull into Policeman Point Roadhouse and take a break. It had begun to get quite hilly for the 10 kms beforehand. 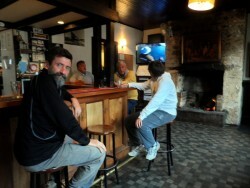 The publican assured us it would be flat from then on to Kingston but couldn’t do anything about the roaring headwinds. By the time we’d ridden another 10 kms to Salt Creek we were stuffed. Despite the very thick, comfortable grass to pitch the tent we grabbed a room for $55 to escape the predicted thunderstorm and strong winds. The food was good and the beers cold. With only no other guests we had control of the TV and settled in for a couple of hours. 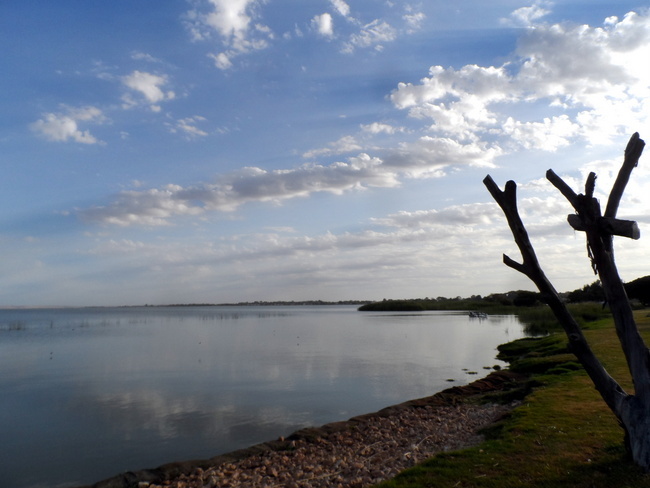 The Coorong itself is an interesting experience. It’s a unique environment but not one that’s particularly pleasant to cycle through unless you have a tailwind and plenty of time to stop and explore the different inlets and viewpoints. It can be very smelly at certain points and the landscape is quite harsh. There is, however, loads of birdlife and is a real treasure for bird enthusiasts. We were treated to a flock of pelicans, flying in formation just as clouds parted for a patch of bright blue sky. I would definitely put it on my “to do” list once we return with a 4WD. The roadhouse didn’t open until 8.30am, so we had to suffice with a muesli bar and a cup of tea brewed on the gas for breakfast. It was a further flat, stark and windy 87km to Kingston. 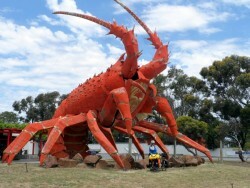 Our first stop was the very, very, big crayfish for a photo opportunity and FOOOOOOODDDDD. We were ravenous by the time we arrived. Kingston is a small, quiet, beachside town with not much going on but I’m presuming the fishing is good judging by the number of fishermen we saw. We followed the caravan park signs and eventually found the park near the beach and booked a rather dilapidated on-site van ($58) for the night. It was good choice as the thunder, lightning and rain crashed around us over night. With only 44km to ride to Robe, we had a late start from Kingston. Once we got over the fact that the wind would not allow us to cycle over 12kmph on the flat at times we sat back and enjoyed the scenery which was much improved over the last few days. The road is relatively flat with a few rollies that would be an absolute hoot with tailwinds but just proved annoying with what we had. 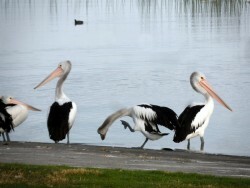 We pulled in at the Lakeside Caravan Park in Robe and booked a cabin. Weather predictions were dire and despite the fact that the grass was green and thick and looked very comfortable we didn’t want to be blown away during the night. The only drawback to the park is the distance of the amenities from some sites. You definitely don’t want to leave things till the last minute. The camp kitchen is very well equipped. It even has its own coffee maker for the reasonable price of $3 a cup. Downtown Robe is full of historic buildings, boutiques and one award winning restaurant (Sails Seafood Reataurant). The beach is clean, white and sheltered. The marina has its fair share of luxury boats and it was fairly obvious there is a good bit of money in the town. The Caledonian is a lovely old pub with Ales on Tap, an open fireplace and a lively local crew, at least on the afternoon we visited. They were all getting psyched up for the impending tourist season that will start in the next three weeks and swell the population from about 1300 to about 15000. Heidi from the recycling plant was very nice; revealing that she’d passed us on the road from Kingston and would have offered to give us a lift if she’d had the room. We assured her we wouldn’t have accepted but the thought was there. Over night the winds picked up and the storm clouds rolled in. We got up as planned and prepared to ride into gusty headwinds. As the rain started to drop we looked at each other and agreed that it was pointless to even try and battle the elements when we could have a well earned day off and head off in much better conditions the next day. We’d already devised plan B to get where we needed to be by Xmas so with the pressure off, we hunkered down to wait it out. As the sun poked through later in the morning, I couldn’t think of a nicer place to get stuck for a day before we cycle to Mt Gambier.